I returned home a few days ago from another very enjoyable visit to the Isle of Cumbrae in Scotland for the 8th Classical Guitar Retreat. I’ve been fortunate enough to have exhibited my guitars at all but the first of these retreats run by Matthew McAllister. 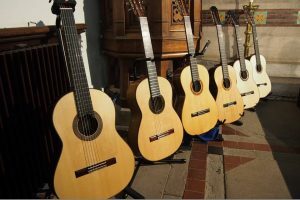 A new feature of the event this year saw a selection of luthier’s guitars played in the great setting of the Cathedral by Elina Chekan. It was a good opportunity for participants (and luthiers) to hear the guitars played side-by-side in a nice acoustic. It is difficult to make comparisons between guitars even in ideal conditions such as this, but I was happy that one of the two guitars that I thought stood out was one of my own! All were good guitars though, and in the end a lot comes down to personal preference. Highlights of the event included concerts by Matthew (some solo pieces and duets with Allan Neave and Aisling Agnew), Rene Izquierdo and Amanda Cook. Sadly I missed the concert by Patrick Kearney, but he did visit the guitar exhibition and tried out both of my guitars. There was a very interesting talk by Uros Baric. Lots of useful information about recording techniques and setup, and using editing software. Worth a look at his website here if you want to start or improve your own recordings. Uros is an excellent player, and got into recording after some less than ideal experiences in existing recording studios. I also gave a talk myself about guitar making. I’ve given a number of talks at the CGR in previous years, this time I decided to look in more detail at just a few parts of the process. As well as some detailed photos, I showed a few short videos covering the initial stages of making the neck, scraping the sides to the correct thickness, and French polishing. You did not mention that you gave an illustrated talk highlighting some of the steps in building a guitar. Thanks George! I’ll add something about the talk. Hello James, Your guitars are just beautiful. I love your 100th. Beautiful to listen to and lovely to look at. Nice to be able to listen to all the different sounds from the different materials used to make your classical guitars.